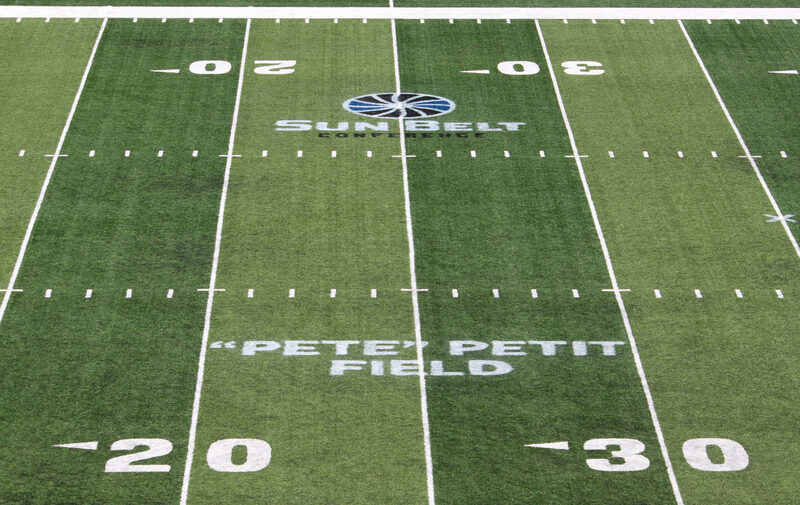 Georgia State named its year-old football field after one of its alumni and largest financial donors, Parker H. “Pete” Petit. Petit’s former pharmaceutical company, MiMedx, is now under federal investigation for allegations of stock fraud. Petit Field is a tangible reminder of that ongoing controversy. Whether or not the Securities and Exchange Commission, the FBI and the Department of Veterans Affairs find any wrongdoing against MiMedx, the field where the adolescent football team will build its legacy may be fraught with controversy if the agencies find any conclusive evidence of fraudulent behavior. The process by which Georgia State selected the field’s official name was entirely independent of the student body’s influence. The Georgia State purchase of what was once Turner Field benefitted the university in two ways: the facility has close proximity to the university, and it has the ability to attach itself to the nostalgia of an Atlanta relic. Georgia State’s students, save for the avid supporters of the Panther football team, are not readily aware of Petit’s potentially fraudulent affair. “Turner Field” is still a common misnomer for what is now Parker H. Petit Field. Petit pledged to donate $10 million to Georgia State in 2017, resulting in the naming of the football field in the new stadium. A year later, Petit was accused of gifting fraudulent MiMedx stocks to the Georgia State University Foundation. Despite the 78-year-old being one of Georgia State’s top public donors, the allegations facing Petit have been largely under-discussed in the athletic department. Yet, as the Panthers play football on a field with Petit’s namesake this season, the situation facing the university is growing unavoidable. So, what exactly is Petit under investigation for and how does it potentially affect Georgia State? In August, The Signal reported that Petit donated stock to the university at a potentially inflated price. The particular process alleged to be used to inflate the stock, as noted by The Signal, is called channel stuffing. Channel stuffing is the act of inflating sales and earnings by sending retailers more product than is in actual demand, leaving the retailer with a surplus of product. According to the report, Petit donated 325,000 shares totaling close to $5 million. MiMedx, now operating without Petit, who was removed from the company’s board of directors in late September, is under at least four federal investigations involving fraud. There is a possibility that MiMedx could attempt to recoup Petit’s donations made to the Georgia State University Foundation, according to The Signal. PETIT FIELD, BUT FOR HOW LONG? Georgia State has used the slogan “The State Way” to help to brand the school’s “innovative” approach to athletics, education and many more facets of the university. One student believes that the school’s marketing of the phrase should influence the outcome of the Parker H. Petit Field controversy. The announcement of the field’s naming came in August of 2017. Georgia State University President Mark Becker marked the occasion as a moment of pride for the school and its legacy. A year after the announcement of the field’s name, the university seems to have been blindsided by the allegations. What began as a momentous occasion in the purchasing of the old Turner Field and the subsequent renaming of the field could soon become a highly scrutinous scenario. “Naming of colleges and schools of all USG institutions and all real estate, facilities, and property owned or leased by the USG, including facilities constructed, donated, or acquired by affiliated organizations of the institutions, requires prior authorization by the Chancellor, the USG Chief Administrative Officer, and the Board of Regents,” the USG policy manual states. The Board of Regents at the USG stands as the singular entity who has control over the addition and removal of its schools’ buildings’ names. In a request for statement, the USG said it is closely monitoring the situation involving Petit and MiMedx and will pursue any action the Board of Regents sees best fitting. “We are aware from public reports of the current investigation MiMedx is conducting regarding restating its financial statements and the resignation of Parker H. Petit as the company’s chief executive officer,” the USG said to The Signal. “The Board of Regents policy 7.4.1 stipulates that a building naming authorized by the Board of Regents can only be modified with approval of the Board in consultation with the Chancellor, and we will continue to monitor the situation for any information from MiMedx’s investigation relevant to Board action,” the statement continued. What exact development would prompt the Board of Regents to conduct a meeting that would result in the removal of the name is currently unknown. “From an athletics side of things, the naming [of the field] was a portion of looking to grow athletics itself, including football,” Moore said. There is no timetable on the university to act to remove Petit’s name. Any action regarding the name of the field could result in a limited response from the university’s population, Moore said. Parker H. Petit Field, to this point, is just over a year old, and few monumental moments have been made on its turf. How the school continues to manage such a developing situation as continued reports surface will be watched closely.